Let’s have a better look at this side view from the preceding post for a second. We can see clearly that these metrics have been retarded in their expansion. But to make the result we see on this drawing right, it would need that the metric had already gain its normal “size”, in a normal expansion, BEFORE it was pushed back in “time” (or in depth if you prefer). And that is exactly what I already described at the beginning of the universe. First, neutrinos started producing “distances” at 10^-43 sec. because of their less than light speed celerity, and thus making observable space expand. Then, at 10^-36 sec. appeared the gluon which transformed itself, 75% of the time, into massive particles. The transformation of those massive particles was responsible for pushing the metric at their center of gravity, back in “previous times” when the metric was smaller. That’s how the first “alteration” of the metric appeared. Gravitation was born (remember the recoil of the one-sided gluon). Once the particle were surrounded by this “altered metric” accretion of particles with mass energy was the equivalent of accretion of “altered metric”. Gee! That was an easy question. But the answer helps me deal with space. Time is not so much a "blurred" dimension after all. I'm addicted to my last drawing. Time is the "depth" of space; so no wonder that i'm surrounded by "past" and where ever I look, I'm looking at the past. Good thread. Now if one treats Reality as granular at the Planck length (composed of 3D cells) grown on the surface of a 4D Hyper-Sphere, then Time and the Expansion of the Universe are the same thing. Thus "Time" has an Arrow due to the expansion being a single direction outwards. Thus each new layer of Cells must be compatible with the previous layer. The rule is simple: "New (Space-Time) cells are grown on any surface that is exposed". That surface being the 4D outer surface. Matter Geometry propagates through Time by being connected with its history. Thus Time has real Depth.. real Thickness. Next, we find that Matter, at the smallest scales, can have no Momentum. We take momentum (macro scale) and push ourselves to see it as existing at Particle Scales. Ie: How does a particle know, from Planck Interval to Interval, how fast it was Moving and what Direction? The only way a particle can move to a fresh new layer of Time.. and maintain Momentum.. is if said particle is connected to its previous Geometry in history. Meaning all Matter is continuously being newly grown (Created) as New Matter through Time Layers. Each new layer of Space-Time and embedded Matter Geometry is being Grown on the exposed surface at the Speed of Light. 1. Time (as we experience it) has an Arrow (outward growth-expansion). 2. Matter can not propagate Laterally faster than New Surface Cells are being added. 3. New Cells must have compatible Scale to previous Cells where Matter is present. 4. Space-Time cells must have variable Scale, thus the Planck Length is not a fixed size. 5. The New Cell size must have no sharp transitions between adjacent Cells. Thus the New Cells, where Matter is present, retains the previous Scale and thus the Planck Length must be shorter near Matter due to its History, while New Cells in Deep Void Space are free to Grow (Stretch) or (Multiply). Thus Voids will Grow in scale faster than Local Space near Massive Objects, such as Galaxies. Thus the Planck Length is a constant, when we consider the Speed of Light as defined by Distance and Time, but the Planck Length near a Black Hole is radically smaller than the Planck Length within a deep Void. Bottom line: The Planck Length is a variable Metric over large distances. That fact (IMHO) produces Gravity. So what exactly is Gravity then? Imagine a Rod, which is a column of Atoms. Imagine we focus on the first two ranks of atoms at the front and the last two ranks of atoms at the back. The spacing between all ranks is even when inertial in flat space. But accelerate the rod from the front (pull it) and the rank spacing between the first two ranks and the back two ranks becomes uneven (non-linear), basically because the last two ranks is the last to know that acceleration is being applied (pulled from the front). If you reverse this and push from the rear, the same non-linear ranking occurs because the rear is compressed and the front is last to know. Thus any acceleration being applied always has the same effect on the rank spacing along the rod. Rank Spacing is greater at the front than at the rear in the direction being accelerated. This is the Geometry effect of Acceleration on Matter. So what happens when you put the same rod, pointing into the Gravity Field, where the Planck Length is shorter at the deeper Gravity Field potential? Answer: Against a linear scale, there is greater distance separating the first two ranks and the distance separating the last two ranks, where distance is the number of actual Planck lengths involved. So the front may look more compressed, but actually, in Planck Lengths, the distance is greater near the front, between ranks, than at the rear. Thus this Matter, in a non-linear Scale, must take on the Geometry of Acceleration towards the smaller Planck Lengths. So simply put: A non-linear Space-Time under-structure forces Matter to take on the Geometry of Acceleration. And that is Gravity (IMHO). This also is why the Physics inside a Black Hole is Standard Physics, with Planck Scale dramatically smaller. So a million Star Masses can exist inside what would "Appear Remotely" to be a volume of space smaller than a Moon. What impact does such a concept have on the so-called Event Horizon of a Black Hole? Is it really emitting Light from a Massive plasma star within.. but said light is simply shifted into super deep Red. I might even predict that Black Holes have Massive Neutrino Emissions and all we need is a decent Neutrino Telescope to prove such. Anyway, the distance around a Black Hole is shorter than the distance through a Black Hole. So the old adage that the shortest distance between two points is a straight line is.. false. Map of Space-Time around a Black Hole. Thus the Green Line path above is shorter (or the same) than the Blue Line path. This is Curved Space (a Density Gradient). Thus Time is New Cell Growth on the surface of a Hyper-Sphere and Clocks don't actually measure Time, they measure Geometry Complexity.. as Dilation in Matter Epicycles. The number of Internal Cycles in Atomic Structures needed to compensate for the difference in Acceleration Geometry or raw (speed limited) Motion Geometry. This might also provide a path to understand Dark Matter. It's not really Dark Matter.. it's Dark Gravity. Dark Gravity exists because the metric scale is non-linear around Matter, and without sharp edges, artificially extends the Gravitational effects well beyond any Matter (the Bridging of Scale). Also, as Matter congregates into lumps, this lifts the growth restrictions within the Voids and causes an accelerating Growth Rate (Dark Energy?) to the Universe. Anyway, that is my current view of such Matters. In a sense, Science has the roles of the Planck Length and Planck Interval.. reversed. Time is the true constant and Length is the variable. Nice to ear from you. I was working on my new book when I got your post. I read as slow as I could. There's material in it, I say. We seem to agree on a lot of conclusions even if we don't follow exactly the same "path". I'll have to study your post before commenting it further. 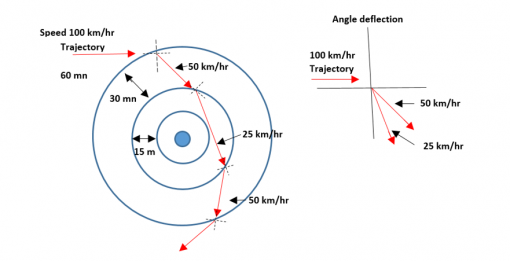 A rocket coming strait (straight trajectory) from space possess just enough speed to put itself in elliptical orbit automatically. When you compare the straight trajectory from space to the axis of the orbit, you find that they have the same angle. There is no alteration whatsoever. Nevertheless, time in the ship is altered in relation to the orbit's distance from Earth's gravity center. Time metric (because it is a distance in time), is affected while space metric (orbit axis versus its trajectory) is not. This would mean that space is not, either warped nor curved, but the gravitational effect is directly connected to time metrics. Mass energy pushes a point back in time; not back in space. But I'm still working on it. As for duplication of space basic metrics (Planck's length) they don't change size; but they produce other lengths we can use to measure. Just like inches when used by a succession of twelve, produces a one foot ruler etc. I just wanted to make sure that we don't forget that our universe is Euclidean; which means it is composed of, in reality, uni-dimensional points; but we can use Planck's length dimension points anyway. I couldn’t delay longer to get back to you. Now if one treats Reality as granular at the Planck length (composed of 3D cells) grown on the surface of a 4D Hyper-Sphere, then Time and the Expansion of the Universe are the same thing. First you’ll have to tell me where that surface of a 4D-Sphere, comes from. It’s the multiplying Planck length that produces gradually the sphere in a "no-space at all", nothingness. It’s not even a void. “The rule is simple: "New (Space-Time) cells are grown on any surface that is exposed". There is no such exposed surface. That surface being the 4D outer surface. Next, we find that Matter, at the smallest scales, can have no Momentum. Where do we find that? There’s no matter yet, radiating period is not even finish. I can’t follow you. We are describing “creation” of space. No matter is involved in it. Sorry. How does a particle know, from Planck Interval to Interval, how fast it was Moving and what Direction? If you’re talking about a matter particle, it doesn’t care how, when and toward where it moves. It simply moves. When it hits something it will deal with it. Of you're talking about light-speed, it takes 10^-43 sec to cover 10^-35 meter at light-speed. It’s not layer of space-time it is layers of space-time metrics. It’s the multiplying of those space-time metrics that produces space and it’s the direction they multiply (outward) that produces time. 2. 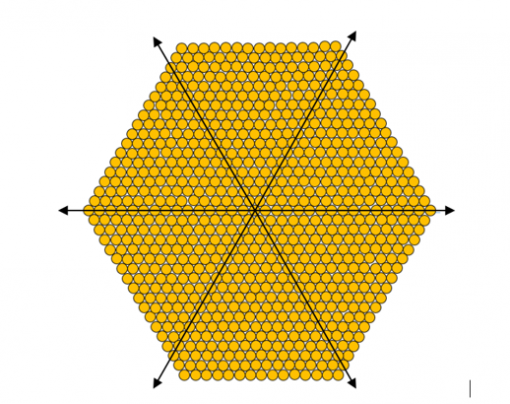 Matter cannot propagate Laterally faster than New Surface Cells are being added. Matter doesn’t exist yet. But space and time metrics “propagate” (add) in concert. 3.New Cells must have compatible Scale to previous Cells where Matter is present. They’re all alike. But I’m pretty sure we aren’t talking of the same thing. I don’t agree none of the metrics have variable scale; they cannot. I can’t change a basic “fact” Planck length cannot increase; it has to duplicate (multiply). They do at Planck length level; that is, if we’re talking of the same thing. Which it seems to me we’re not. You’ve talked of metric, particles and now cells. I can’t follow. Sorry. A black hole is a collapse of metrics (as is now seen as collapse of the particles forming a star). But particles don’t collapse, they undergo pressure that reduces the metric of their environment which compresses them. As for the Planck length, that is exactly the length you find at the “bottom of a black hole; and the hole opens right into Planck epoch, before 10^-43 sec. This I knew already but I thought that it was provoked by the pressure of mass energy on the space metrics. Now I’ve found that it was the pressure on time metrics which confirms that a black hole is a regression in time; not in space. I’m beginning to wonder if we can see a black whole if it is strictly a time alteration. I feel you’re dealing with to many things at the same time; let time metrics take care of expansion and let Plank metrics take care of space. Let them work in front of you and look what they do. When you see space and time, then can appear mass particles. If we look at all the composites of the actual universe, it's like trying to analyse a small piece of vegetable in boiling vegetable soup. I prefer looking my wife while she prepares that soup and look before she mixes all vegetables. And then again, it might be that I'm too much in my writing my book and I can't get it out of my head to understand what you're trying to tell me. I'll see in a few days. 1)The basic metric of Time is a one-dimensional point. It's the successive duplication of that point that produces time flow. It appeared right at the beginning of Planck epoch. To put it simply, Planck epoch has a time length; so time existed then. When space appeared, it followed the space metric growth's direction, that had just appeared. Expansion of space couldn't go anyhow but forward; which decided the direction of the "arrow of Time". 2) Space metric appeared at 10^-43 sec and had a diameter of 10^-35 meter.It started to duplicate in all direction producing a volume. So, if you start with a point for Volume and you increase the size of that point every Planck Interval, then how big can a point get volume wise? A really huge point? What does that even mean? Seems like you will need to define More points to increase volume. In that case, what is the Geometry of additional Points used to create increasing 3D volume? A Cube? A Tetrahedron? A Octahedron? A Dodecahedron? There are many 3D shapes that fit together without leaving any Gaps. But all have a feature I pointed out earlier, each new addition will have an exposed surface.. a surface that doesn't share any inside previous Geometry surfaces. This is describing a Cellular Growth of Geometric Volume.. a Granular Space-Time Cellular Construction. Thus I had already suggested the Growth (expansion) of New Volume Cells, that occur on the exposed surface of this growing Geometry, constitutes the Expansion of the Universe.. with each side (from Vertice to Vertice) being a Planck Length. The problem now is we have a Physical Center to the Universe and our Cosmic View precludes such an obvious center. So if we elevate to the next Dimension and call Time the 4th Dimension, then we have a Growing Hyper Volume and the direction towards the True Center of the Universe is the direction pointing towards Yesterday. The direction that points away from the Center of the Universe points towards Tomorrow. Once one realizes this simple Geometry, then one can see the SURFACE of such a construct is 3D. In other words, there are 3 directions of possible surface movement (Left-Right)(Up-Down)(Towards-Away) or (X,Y,Z) and one is free to move in these 3 spacial directions without ever Moving in the Direction (axis) of Time (4th Dimension). But if we have an Arrow of Time, this describes the simple fact that we must only Exist on the Expanding 3D Surface of such a growing 4D Hyper-Volumetric construction. Are we on the same page thus far? :-) “Increasing size” doesn’t mean anything in view space expansion. I’ve already explained that the starting volume of space metric had the Planck length. And since “half a Planck length” cannot exists, that initial volume cannot “increase”. It has to duplicate itself. How big a bag can it fill? Bring up the bag you want, it’s going to fill it. It’s being duplicating since 13, 7 billion years; so…there’s no limit since it is producing “space”. Let’s start with one single volume. 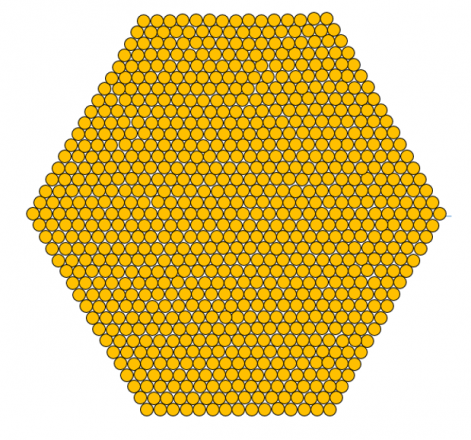 It needs to duplicate itself 12 times to surround itself completely (6 around, 3 front and 3 back). If you draw it, you’ll find that you cannot accumulate spheres around another sphere without leaving small gaps. All those first “space spheres” are full of energy (they still are today, but a lot less dense). Naturally you cannot have gaps between “space spheres”; what would those gaps be made of? So all surrounding energy dilutes to fill those small gaps; and that produces a bigger sphere than the first one, which has less density energy than that first one had. Once that new bigger sphere is done, energy density equalizes itself in the whole sphere. And space metric spheres keep on multiplying, creating bigger and bigger spheres, always diluting the total energy density. There's no wall circumference around the bigger sphere; it's a volume of space surrounded by...nothing. The word "universe" means "all that exists". A space metric sphere doesn’t fit without leaving gaps; and the metric of those Planck spheres doesn’t change shape. When the inside energy of a new created sphere equalizes its density, the whole volume gets the same density, the gaps are filled, defining a new bigger sphere (of energy effectiveness); but the metric of each small spheres stays the same; even though they are "space spheres" (no wall circumference). Their energy can fill the gaps but they don't lose their metric. It’s like the inches on a one foot ruler; you get a one foot ruler but the inches do not disappear. Inches are metrics just as those spheres. They are what is called the tissue of space. Would it be surprising that basics processes continue to operate during all the universe’s evolution? It wouldn’t surprise me, I can vouch that. I defy you to find me where that center is; you have one every Plank length. The reason we can’t find the center of the universe is because they are everywhere. I’m looking at the universe right now and I’m right at the center. What about you? So don’t elevate. Time is also made of metrics, since a minute is also a distance (a time-lap). Furthermore, Time is not really a dimension; it's simply forward movement. You have to define a point in space before defining a point in time. If you don't define a point in time when defining a point in space, this last space point stands simply in the middle of the universe; just like every other space points. Time is not the same thing as a space metric. Space started at 10^-35 meter of diameter, at 10^-43 sec after Time = Zero. Time started way before that instant. You would have told me, just then, when Time began. There was no volume at the beginning of Planck epoch; there even wasn’t a surface. The only thing existing at that moment (zero time) was an invisible, size-less, one-dimensional point. That is Euclid’s geometrical description; it’s not metaphysics, it is geometry. And our universe is Euclidean; it's no use to torture our neurons to twist dimensions. It doesn't get us anywhere. Furthermore, Euclid explains that a segment (a line) is a succession of such uni-dimensional points. That is what the Time metric is. A succession of points in straight trajectories. There are six of them for the whole universe; but that's another subject. So the arrow (line) of Time started at zero sec and has been producing successive points ever since defining that always going forward Time movement. It is evolution that is directed by time (or vice-versa); not space. The only space we can observe is the evolved space; which means “passed” space-time. I’m not saying this surface doesn’t exists; I’m saying that it is facing toward “nothing”; which is the potentiality of "what will be" (future). The universe is all that exists; it is surrounded by what doesn’t exist... yet. So the outer side of the surface you talk about is facing toward the outside where nothing exists. The inner surface of that sphere we cannot see (yet); but we can see the sphere that was created by the space metric 380,000 years after Time zero; it’s the CMB. And where looking at it by the inside; the CMB is all around us. All space that exists is inside that volume; and the majority of that space has a flat topology where all geodesics are straight trajectories. You can say that, sure; but don’t forget that you’re facing toward the inner part of the sphere, looking at the past. I just realized something: The Sumerians believed that they were backing toward the future. Who the hell told them that? Same regards to you my friend. First, why use Spheres? Other Geometries fit together without Gaps. Unless you need those Gaps, as you appear to do so, by suggesting those gaps are filled with Energy. It's this stage that is just an Hypothesis, without a definition for Energy. Next.. a Cluster of Spheres doesn't require those Spheres to become larger with each generation added. It should be assumed the Diameter of each Sphere is a Planck Length? Otherwise.. doesn't that imply a growing Planck Length Scale? Also, for each Generation of surface Spheres being Grown.. is new Energy auto filled into the new Gaps or does that energy bleed in from earlier Gaps into later Gaps? And can one define the nature of said Energy? Again, from such a Model, we would see all Galaxies moving away from a Central Location, but what we actually see is all Galaxies Moving away from each other. Also, this expansion by adding new Spheres would be rather disruptive to any structure built into this fabric, unless said structure also grew with each new layer. But then if everything is growing.. then nothing is growing.. and the Universe would appear static growth-wise. Or one adopts the stance that where Matter exists, the New Sphere Size being grown is retarded so deep voids can grow faster than inside a Galaxy. But then we come back to my original premise that the Planck Length is only a constant relative to Light Speed, but at different places (deep Void vs near a Black Hole) the Planck Length is a Variable. Hopefully, I persuaded you away from Spheres.. because they require infinite Resolution to define a Surface. And if all Spheres are the same size, it would look like a bag of marbles (without the bag.. lol). But let's make it a bit more Simple and deal with a a Flat 2D Universe populated with Flat Landers. Flat-Lander bouncing a toy Circle. I gave his outline a Human appearance to suggest some familiarity. But in his world, he can't look towards the Camera. Any personal sensory inputs can only be perceived from the edge of his physical self. In other words, his eyes are located about where one might suppose his ears to be.. etc. But also notice.. I have given him a 3rd Dimension of Time as Depth. History is in the direction further from the Camera. My 3D view of him has been captured at a precise Time to show his flat front surface to me. His Universe is Expanding in the direction towards the Camera. Obviously, he cannot see the Empty Void ahead of him, on this Growing "Front" Side, because all information (Light) can only come at him from his sides as a flat 2D Plane of (X,Y) Axis. Also note that if he rolled his circle on the ground, that the Axis of Rotation would be in the direction of "Time". He would have to be pretty smart to understand such.. as that Axis of Rotation is invisible to him. Another Member here (Faradave) has labeled such as Chronaxial Spin. We might also note that here in our 4D reality, that it is likely that some (if not all) particles also rotate around the Axis of "Time"? A 2D particle producing 2D Photons. Now I've taken the Liberty of using a Space-Time Cell Structure of a Square, rather than a Circle. The above Animation only has two Time Slices. Past and Next. Note the particle at upper left is producing an endless stream of Photons without depleting its Geometry. These Photons can be message carriers and they are moving at the Speed of Time (Speed of Light). Also note these Photons have no Momentum. Their motion is produced by their History Geometry. They can't exist unless new surface Space-Time is always provided for their History to project new placement Geometry. Since the history for the above is just one Plank Interval Behind, they have very limited freedom. Only One velocity can exist and choice of Direction is equally Limited to Vertical, Horizontal and Diagonal. To get more freedom, we require the Geometry of additional History layers of Time. How may Layers of Planck Time is required for Particles in our Reality to enjoy the wide range of Velocities and Directions we observe? In other words.. Momentum is derived from History. Momentum is not defined by (nor can it be) an instantaneous singular Present Moment. Thus History has real Thickness. With this Model we see (as in the Flat-Lander bouncing a circle) that History is probably never Erased and new Matter is always being Created onto the next blank Surface as an ongoing Change in Geometry as structure propagated from the past. As you have already agreed, Time is Growth.. is the Expansion of our Universe. Or in other words.. without New Space-Time Growth.. Time would Stop. Also, Energy is not some intangible substance but rather Energy is Geometry. Note the Particle animation is a Quantum Mechanics view with each Space-Time Cell given the binary value (eigenvalue?) of True or False. Note: this could represent the Planck Scale Quantum or it could Represent the Large Scale Metric.. with each Cell representing Light Years per Cell. Note: Because each Cell is based on the fundamental metric at the Quantum Scale, that Light would take the same amount of Time to cross each Cell, regardless of its comparative size. Where cells are smaller is because Galaxies are present in those areas. This is akin to the Filament Structure we see in the Cosmos. As you suggested, new cells may experience a reduction in Growth Rates when local Matter is binding the size of New Cells via those Cells History. Lot's more to say.. but I have to leave for awhile..
1)	Sphere is the only possible shape produced by projection in all directions by energy. I’ve never heard of a square explosion ;-) . So no, I don't need them at all; but I've got to deal with them since they can't be any other shape. 2)	Those gaps are not filled with energy; they get filled by “borrowing” energy of other spheres (anyway spheres of energy are not confined. A metric doesn't restrain them). A “gap” in space is impossible; what would it be composed of? Do you know anybody that can tell you what energy is? Nobody know really. We know it’s effect; nothing else. doesn't that imply a growing Planck Length Scale? Didn’t I explain it couldn't get bigger? So they stay the same size. The inches stays the same size but imply growing scales as a foot then a yard and so on. You need more and more Planck spheres that have energy. Decupling is “copying”. We're talking of a simple process of expansion simply replacing size-growth here; nothing else. And the only reason we have to is because the universe is more than Planck length. The whole total sphere constantly equalizes its energy density. There's no "energy shells" in this process. Said energy is kinetic; it’s evident. There’s something you are forgetting here: ALL existing (duplicated) Planck sphere keeps on duplicating (multiplying). So space is constantly “created” between galaxies. That’s why they move away from each other. Even though they have their own personal velocity. Adding new spheres of Planck length doesn’t seem to disturb anything yet, except moving galaxies from each other. The structures you’re talking about aren’t affected by expansion; so they’re not disturbed by it. Where there is matter, there is not expansion; thus no growth of space sphere there. How can it be variable if it is the smallest possible length? That’s illogical. Well, let’s do it; actually there’s only on single space sphere that is called the Universe. 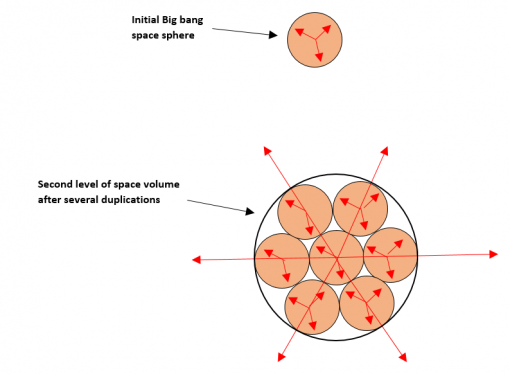 1) It has grown by expansion and expansion is a duplication of small “space” volumes that has Planck length diameter. 2)When you consider the universe as a whole, it is one single sphere still expanding. 3)You get to “observe” the smaller spheres only where the expansion is “blocked” by mass energy (starting from galaxies spheres, stars spheres, planets spheres, moon spheres and then since you’re the observer you have to bend to lower spheres than yourself; meaning atoms spheres (electronic shells), Protons and neutrons spheres composed of quarks spheres; and that's where it stops, because that's where it started. Change the word “spheres” for “field” if you prefer, and you’re in quantum mechanics since the galaxy sphere. What do you want it to be composed of? It’s space produced by motion, which is caused by kinetic energy.. Does space have a wall to keep it united in a single thing? The situated non-existing wall is where the motion ends around the growing universal sphere. You can't be serious. My only resolution is to understand that a sphere is a surface to which depth was given. And in fact, it is nothing else. That doesn’t imply having to locate anything inside that sphere; which, by the way, cannot have anything else than a "flat" topology where geodesics cannot be other than straight trajectories. And that’s exactly what it is, but the marbles are invisible since spheres of space have no “walls” to hold them. Finally the marbles (Planck spheres) have no solid shape and so has the bag (Universe). Plank length is a metric; a definite size to measure things with. But it’s also the smallest possible definite size you can find; and since the universe had a start and is still growing, it must have started at the smallest possible size. I’m not the believing kind of person; whatever I hear, think or say has to submit to logic; whatever it or who is. Sorry you can’t do that you won’t see anything around you, 2D doesn’t have thickness. Your flat-Lander is moving through 3D. If you see him, you’re not in that 2D universe even if he’s flat. Wrong; his universe is expanding into a greater surface without thickness. That is exactly what Planck epoch was; except it was expanding by the centrifugal effect, because it was rotating. Our universe doesn't rotate because the Planck epoch kind of "exploded" energetically, giving depth to the previous surface; stopping right there the previous rotation of the former surface. there is no growing “front" side for a 2D. Otherwise it would gain “thickness”. It grows side-ways. 1)	Time has started when time started. I guess you’ll accept that. That’s when Planck epoch STARTED. So Time cannot have 2D since it originated from where 2D appeared. That point (invisible) defines, by duplicating itself, in one direction: the arrow of time = forward. 2)The axis of rotation cannot be in the direction of time since time is in the axis of the growing surface; so the time line progresses in the direction the surface expands. Which is normal for them, since time comes from the “origin” of all particles; and they all origin from their center. They don’t even exist in the epoch we’re talking about. Photons didn’t appear in the universe before at least Bottom quarks appeared; which is sometime during inflation between 10^-36 and 10^-32 sec. What happens in space after that is related to electromagnetism; because the universe became electromagnetic at that moment. What is that, if not a layer of space at a certain determined time? And since matter is energy, you saying the same thing as I am. 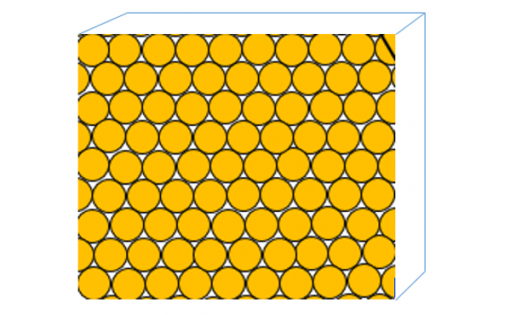 Time pierced through the centre of the original Plank sphere (center in yellow) and progressed in a straight line. 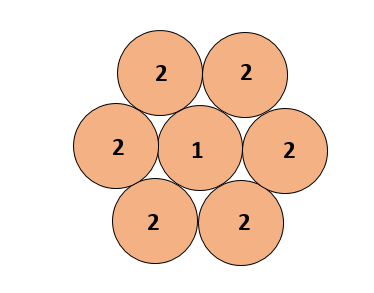 As you can see on the drawing, only some series of the spheres have their center in line with the center of Planck sphere. I’ve put them in different colors. Each color forming a circle around the center, passing through those spheres. One serie is brownish the other one is greenish. The difference between greenish and brownish is because they appear in two different layers of space spheres if your draw a circle for those spheres. Note that the same process goes for each and every space spheres. Since they are all centers of the universe. So, finally you get that same "clock" for the whole universal sphere. I don't agree. To me energy is what produces work. Space is geometry; now space is the work of kinetic energy; no motion = no distances thus no space and no time. It could and it would if it was “flat” topology; which, sadly here, isn’t. When ever you have time. What exactly is distorted; Time or space? A friend of mine owns a gold mine. And when he brings up pieces of gold from 1000 feet deep, sadly enough, the gold nuggets don’t get bigger going up; so space is stable. On the other hand, if he brings a clock down at 1000 feet down, just as sadly enough, the damned thing doesn’t keep time properly; so there’s your proof that Time is distorted. Note that Time started just after "Time = Zero"; while space started at 10^-43 sec. So they didn't start at the same moment. My question is: Why do N and O electronic shells around a nucleus, open before the previous shell is "full" of its number of electrons? As you can see I have installed the electrons in their shells, divided in subshells (2+6+10+14) as described by quantum mechanics. The different colors of electrons indicate when the next shell “opens”. 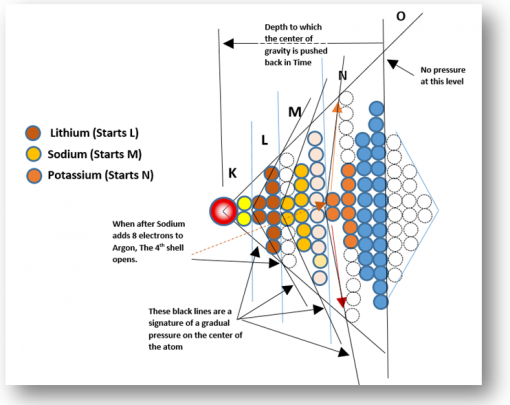 We see that the L shell is full when the M shell “opens” with the Sodium; but the M shell has only 8 electrons when the N shell opens” with the Potassium. That N shell is the one that contains the most electrons (32) the next shell falls back at 18 electrons, and the last shell (not shown) at 2 electrons. The total electrons in a “natural” atom would be 98; in fact it is 92 with the last natural atom, the Uranium 92. The line between shell O and shell N is “straight”; and we see plainly that line being bent gradually in two, by a pressure directed toward the center of gravity of the initial atom (helium). Impossible to keep on saying that gravitation isn’t effective at the atomic level. This same line is a “border line” where the atom of helium was first pushed back in Time (and not in space); since the angle of what composes a helium atom is the smallest of all. Nothing has been pushed farther back. It means that it’s more bent (here synonym of older) than atoms that where made later. Once again the density of the environment is notable in this fact. It gradually decreases from the epoch of Helium towards later produced atoms. It’s easy to see that each series of atoms produced successively, underwent gradually decreasing pressure following the gradual expansion of space and dilution of energy density. We can also see that starting from shell O toward “later”, the electrons have passed the point of most pressure and the possibility to “evade” the grip of the gravitational effect was increasing rapidly (Time was catching up); at the end of the next shell the active field of the nucleus was null. So it was impossible to produce atoms with additional shells. Is there a difference between the gravitational effects at this level compared to our own level? If I made the comparison; I would say: Shell N = Galaxies, shell M = stars, shell L = planets and shell k = Moons. Those are all different orbit levels; just like shells are different orbits of electron clouds. It seems to me as a pretty similar structure. If we could define the width of each shells, we might be able to define the “width” of Time deformations around galaxies, stars, planets and moons. You will certainly notice those white empty dotted electrons in M and N shells. I was just checking how many electrons were needed to reach the angular line made by the nucleus. The result seems to show that when a number of electron is enough to reach the angular line made by the precedent first sub-shell, it provokes the opening of a new shell. The proof came out when I took the electrons of the second subshell of each shells and add them to the first subshell of each, the electrons reached that angular line. What this shows is that, when, in the M shell, the numbers of electrons reached that angular line (placing them in the first subshell), was the exact moment when the succeeding N shell “opened”. As for the N shell, the succeeding shell opened when the second subshell, extended by the number of electrons in the third subshell, reached the same angular line. So, I found out the “why” to my question, but I’m still trying to figure out the complete significance behind it. One thing is remarkable though: Once more, we see clearly that the gravitational effect "applies" its pressure on Time "toward the origin of atoms", rather than on space. Our universe is Euclidean; which means that it's composed of uni-dimensional points. If you stop the expansion of one of those points with mass energy pressure, you get a volume of space metric that is "Time blocked", making that space volume "stable"; like a galaxy for example. The universal Time flow being blocked, the volume instantly adopts a new "Time start" which flows gradually to rejoins the universal Time flow. The lap of Time it takes to rejoins to the universal Time flow defines the volume of space affected by an alteration of its own Time. The farther its own Time flow gets from the center of gravity of this space volume, the slower its time flows; but it is always faster, in its own space volume, than the universal Time flow until it joins it. The space the Time flow had to travel to rejoin Universal Time flow is the volume of space that has "Time altered". Universal Time flow gradually slows down because space expansion is accelerating while the stable volume of space is not expanding. We couldn't understand that before observing the accelerating expansion of "flat" space. What is “space” in reality? 1 -Space is composed of small “spheres” having a diameter of 10^-35 meter. 2 -These “spheres” cannot be compressed or stretched, because their “intermediary” lengths, to permit it, cannot exist. You cannot have a “half-Planck-length”. Which means that the “geometry” of space cannot be deformed. 3 -Expansion of space has, then, to be a continual duplication of each of these “small “spheres”. But the universe is not limited to “space”; the universe is also an invariant sum of “energy”. A -All the energy of the universe is balanced through all its “space”; meaning in each “spheres”. Which is normal since those are “metric space” spheres and not closed “containing” spheres. B -This means that the energy spreads in each appearing duplicated sphere, since only the whole space volume of the universe can be considered as a “container”. C -The fact that each spheres duplicates, makes it normal that the overall density of energy in space is always balanced while diluting. D -This density of the total universal energy diluting constantly, releases “pressure” on this energy; which permits it to manifest itself more “freely”. The result is that the duplication of basic spheres augments its “ratio”, because it happens everywhere (there's no "mass energy" yet). E – Augmenting the “ratio” of duplication of those “basic spheres” can be interpreted as increasing speed of the expansion; and this, without the need of any sort of “dark energy”. Where does that universal energy come from? To answer it, we have to understand that the volume of the first manifested sphere had a diameter of Planck’s length, and Planck’s length is definitely not equal to “zero”. So the origin of this energy has to be between the “zero length” and the “Planck’s length”. And since Planck’s length couldn’t appear in our universe before 10^-43 second, the origin of that energy has to be before that “moment”. Which situates it during what is called the Planck’s epoch. Furthermore, these Planck conditions tells us that the Big bang, which is the beginning of our universe as a “volume” (space), as to also be situated at the Planck’s Time (10^-43 second). Consequently, the accumulation of that energy, that had to start at “zero”, started when Time stopped being at “zero”; and it attained its maximum intensity when the Time clock stroke: 10^-43 second. That’s when the Big bang occurred. Since the overall energy of the universe is an invariant, and since it was accumulating during Planck’s epoch, we have to accept that the Big bang manifestation stopped the accumulation process of energy. 2) it started duplicating because it couldn’t be simply “stretched” or “extended”. There cannot be any doubt that the nature of that energy was “kinetic” since its result was “motion”. 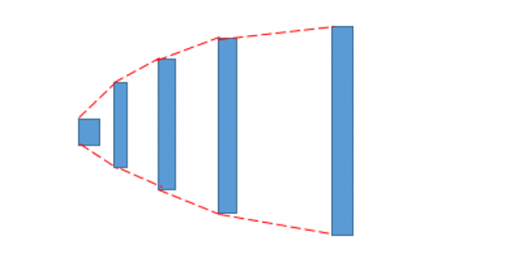 If you observe duplication of spheres in one direction, you get a "trajectory" which defines a motion. Now we also know that the universe has another characteristic that we didn’t talk about yet. This third characteristic is that it possesses a “Time flow”. Which means that, in the Big bang option, Time has an existence before being “relativist”. Time started when the “Time clock” stopped being at “zero”; and it started by being a “Time arrow” that transformed itself in a “Tine flow”. Naturally, each small “space spheres” possesses this same Time flow; which makes it “relativist”. But the universe itself, as a whole, possesses its own Time flow that started at the very first appearance of the very first space metric sphere; and this universal Time flow is NOT “relativist”. It is absolute to the universe. The universe cannot be 13, 7 and 14, 9 or 15, 6 billions years old at the "same Time". The Time arrow of Planck’s epoch was composed of a succession of unidimensional points just as a segment (line) is described in Euclidean geometry. The importance of this is that a unidimensional point doesn’t have a definite “size”; in fact it doesn’t have “size” at all. So it cannot be compressed or stretched. On the other hand, whatever it represents can be shorten or extended. Time flow would then be malleable whether it be “relativist” Time or absolute “universal” Time. Now this leaves us to find out what this absolute universal Time looks like. We have to understand that whatever metric space sphere we choose to be the center of the universe, it will permit us to observe how the “absolute” Time flow of the universe expresses itself. And then will we be able to see the consequences. 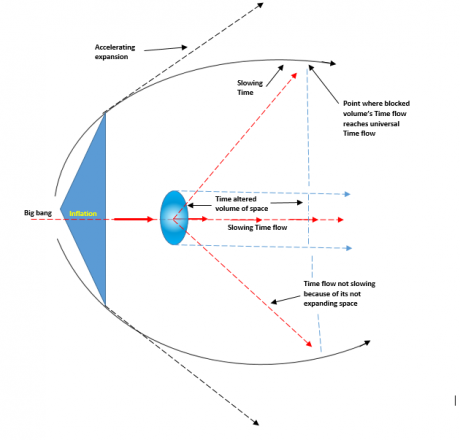 As you can see the universal Time flow is limited to six “trajectories” through the universe when observed as a whole. All other Times flows are “secondary” to the universal Time flow. Which means that only these “secondary” Time flows are “relativists”. Meaning that they are the ones than can be “malleable” or, if you prefer: “flexible”. Time in itself is malleable; but when flowing through space, six of its flows becomes “absolute” because space cannot be “warped”. 1 – Space with “absolute” geometry structure. 2 – Energy which is invariant. 3 – Time flows of which six are absolute while the others are relativist. But the main aspect of it all is that only the “relativist” Time flows are “flexible”; nothing else in the universe can be altered. The other aspect is that each space metric spheres, being a center of the universe, possesses six “absolute” Time flows just as the universal Time flow does. And these are the basic facts we have to submit to, in order to describe whatever we observe in our actual universe. What is promising and thus supports our view is that, by doing as we did, we've solved the problem produced by the need of "dark energy" to explain expansion; and since "imagining" a non explainable solution isn't an explanation...I guess we're allowed to go on. The birth and the life of...our Universe. And if possible, it's going to be "free" on line. Money is not my object. What process can explains the decrease of density we observe? The energy is diluted because it has to fill the "gaps" between metric spheres. And this also explains why, later, particles "decay" to adapt to their environment. Their "decaying process" is the same as the "filling gap" process. Which prevents having to "invent" any non observable factor involved. This also tells us that total space is greater than the sum of duplicated metric spheres. Which means that the sum of the density energy of composing spheres is greater than the total space energy density of the universe. A process provoking something very similar to what we observe later and described as "binding energy". Furthermore, it also means that if space is produced at light speed, duplication of spheres has to be manifested at a bit slower than light speed, giving Time to fill the gaps. And since the duplication of space spheres is what defines motion (a trajectory being duplication in one direction), this slower speed of "motion" permits the universe to be "observable" because of "non-null" distances and "unfrozen" Time. What would be the succession of duplication for that initial space sphere metric? But that is conditional to the non-appearance of the gluon (in fact succeeding Top and antiTop quarks in 75% of the occasions) occurring during this period to "block" some spheres from the process. Finally all observed basic laws of physics are pretty much accurate in these described events. I guess some mathematicians might have fun creating new formulas that would explain this logical description of the beginning of the universe. At least they could escape the need for the "infinity" value by having definite "sphere" values based on Planck's length. Which would, probably, make the formulas pretty much simpler. They might even be able to pinpoint the initial kinetic energy value of the process and compare it to what is actually calculated as accelerated expansion (if it is; if not, they now could calculate it). Which fundamental particles decays into a Down quark beside the (sometime) Bottom quark and the 5% of Charm quarks? Where do so many Down quarks come from? Now we will use our sphered « Universe » to describe the events that happened after the Big bang. But we will start at an “off-centered” sphere (on the right) to make sure we have enough “space”. 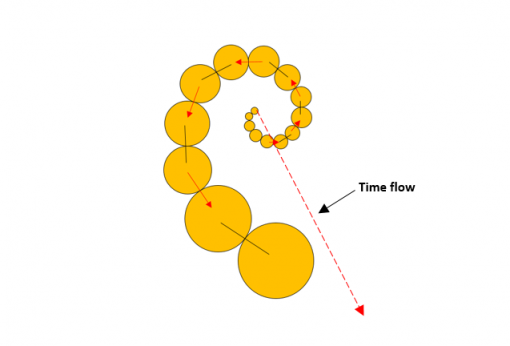 1-	The first sphere appeared and duplicated producing a second “generation” sphere (in yellow) defining the Universal Time flows (red arrows). 2-	Since the expansion is produced at light speed and it takes 10^-43 sec to travel 10^-35 meter, and since rotation of the gluon, after Big bang, was done at light speed, it took 10^-43 sec before the gluon, doubling its size in one rotation, came back in our universe. Which is represented by the second row of space spheres surrounding the center one. Naturally gluons installed themselves where there was less centrifugal universal energy flow (black spheres). 3-	Gluon’s fronts where immediately separated from their backs (in grey in the succeeding sphere). 4-	From then on, the universe became electromagnetic (grey circle. Gluons + neutrinos). 5-	Then appeared the Top and Anti-Top quarks (dark brown) that immediately decayed. A) Top = Bottom quark (light brown) and W+ boson (dark blue). B) Anti-Top = Anti-Bottom and W- boson. 6a- Bottom quark decays in a (dark red) Charm quark (or a Down quark) and an Anti-Up quark (light yellow) plus other hadrons not identified (all 9 particles in between in our drawing). Note that our decays follow the particle’s Time flow and the length of arrows grossly defines the “life span” of the particle. 6b- while the Anti-Bottom quark decays in an (dark red) Anti-Charm quark (or an Anti-Up quark) and an “unidentified particle” that could be an Up quark. Note that our decay process follows the particle’s Time flow, as it was doing before with preceding particles. 6c- W+ boson decays into an Up quarks and an Anti-Down quark. This last Anti-particle is doubtful since it would be too close to the Universal Time flow (see drawing). And since a space sphere is still available between the Up and Anti-Charm quarks, I think that the W+ boson decays into an Anti-Down and an Up quarks, following one single Time flow just as the W- boson does a bit higher on the drawing. In regard to the energy density of the surrounding space metrics; we remark the possibility of having Up and Down quark at this period, instead of Charm (5%) and W+ decay. 6d- W- decays into a neutrino (yellow particle projected in the Universal Time flow) and a Muon (in grey). Which is acceptable where it is shown since a Muon is an electron and doesn’t have a center of gravity to its “mass energy”. 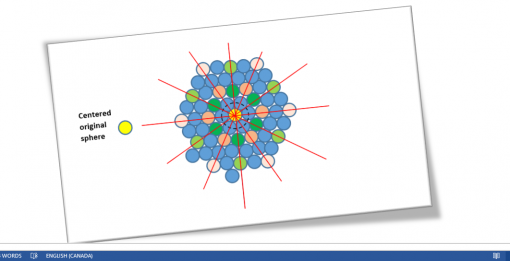 7a- The Charm quark decays into a Strange quark (95%) or a Down quark (5%). One of its Time flows makes it annihilate with the Anti-Charm quark (brownish star). 7b- The Anti-Charm quark decays into an Anti-Strange quark (95%) or an Anti-Charm quark (5%). Observe the repetition of producing a Charm quark (5%). Note: Where Time flows of particles crosses (at star shapes), the particles are annihilated from these flows but not affected at other Time flows. Why? I don’t know; it’s just a try (and a guess). b) Anti-Charm in a Down quark and another Anti-Charm quarks which both results become Mesons D+ and D-. Note that all mesons are unstable and their components separate very quickly (10^-13 second). They cannot be shown on a 2D drawing but we can imagine them in 3D. Mesons B+ and B- are composed of an Anti-Bottom quark plus either an Up, Down, Charm or strange quark. This period would also be the moments when several kinds of exotic hadrons are produced and are observed in actual researches. These new observations could eventually explain the supposed asymmetry between particles and anti-particles. The symmetry could have existed but future matter components would have been protected from annihilation inside those exotic hadrons. There is a lot of work to be done on the precision regarding decays outside my grey circle (the fourth circle) which is at the Bottom quark level. Actually the different hadron colliders are experimenting and discovering new information at this “mass energy” level. The problem in my drawing is representing the Time laps between events when I count 10^-43 second for each metric sphere. I’ll have to find a way to present all events in one drawing. It can be done if I specify the start of a longer Time lap for each sphere outside the Bottom quark corridor. I’ll work on it. If you have any idea or see anything I didn't, don't be shy to manifest yourself. If we take the Big bang model as being the most probable, we cannot use maths to explain how it started. Which means that we are left only with the use of logic. But then, it would, maybe, also explain the origin of maths. We will see. So let's take our responsibility. Let’s address the question logically and define the very first step of everything that has to start with nothing. Otherwise, the Big bang theory is nothing else than a science-fiction scenario. 1)	Everything started at “Zero”. Which means total absence of: energy, motion, space, temperature or whatever etc. 2)	But, logically, something had to be “present”, somehow, in order that what we observe today, came to be. 3)	The only “thing” possible “to be”, when everything was at a “zero” value, is a potentiality that had a “zero” value, but could get a “non-zero” value. Which is exactly the definition of a “potentiality. And, in fact, in order for a “zero” value, to have any significance, you need the presence of a “potentiality" of having a “non-zero” value; otherwise your “zero” value doesn’t mean anything. It cannot even “be” a “zero value”. To be “zero” ask for the chance of “non-zero”, also, to be. 4)	Now, the only reason we have to consider this “non-zero” potentiality, is the “fact” that we, today, can observe something that has a “non-zero” value. In other words, we do observe things like energy, motion, space, temperature etc. that “exist”. 5)	So, when everything, that actually exists, had a “zero” value of existence, there was the presence of a “potentiality” that something could, if ever the eventuality came to be, have a “non-zero” value. 6)	“Eventuality to become” involves the condition that “Time” appears, since “eventuality” lies in the “future”. This gives a “status” to our “zero” value. It means that this zero value is in a state of no “future”, thus no “past”. It puts it in a static “present state”. 7)	The word “static” confirms the absence of “motion”; but it also specify that “Time” is a “motion” starting from the past, going through the present, towards the future. 8)	So now, in order to have “Time” existing, it requires that “motion” is manifested. 9)	But we know that “motion” is the manifestation of energy; so we first need energy to appear. But how can we get that, since we don’t exactly know what energy is? 10)	We don’t know exactly what energy is, but we can feel that it has to be an “urge” of some kind. And the “urge” we are talking about as to be a "vibration" which is a "motion". So we are looking for a source of an “urge” to “move”. The question becomes: What could provoke an “urge” to move, to something that has a “zero” value? 11)	The only answer is: an “uneasiness” toward something that could eventually come to be, thus menacing the "static present" zero value. Which brings us back to our initial “potentiality” ad puts us exactly where the “zero” value stands in its “emptiness”. But it also make us realize that the main problematic is assuring the "viability" of the zero value. 12)	Which means that the source of “energy” needed to produce the motion, in order to start “time” flowing, was the non-manifested “presence” of a “potentiality” to get a “non-zero” value which made the “zero” value anxious. And this anxiousness of the zero value is what made the “non-zero” kinetic energy appear and assured the "viability" of the "non zero" value instead of the "zero" value's. I just noticed that it took us 12 steps to get out of the “darkness” cause by the absence of everything. But daylight isn’t here yet; we’re barely at Dawn. Only energy and Time exist yet. I also noticed that explaining the real "status" of the zero value is the source of all maths. So they might be possible to be used after this post, if you want to, without the need of "infinity". Which should help quite a bit. a) The proven fact in physics is that an object undergoing circular motion experiences centripetal acceleration. b) Since the centrifugal effect had to be manifested BEFORE the centripetal effect, the centrifugal acceleration preceded the centripetal acceleration; thus making the centrifugal energy more “intense” that the centripetal energy at any specific "moment". Centripetal is always "following" as a consequence of centrifugal. c) Is the difference energy intensity shown by the length of arrows. It’s easy to understand that all three aspects involved in this event, are gaining in intensity relatively to one another. If one double intensity, all three double intensity; if one increases exponentially, they all increase exponentially. One fact remains, which is that the initial energy that started the motion is constantly manifesting. But since, being "constant", it doubles after the first rotation, it adds doubled energy to the second rotation. And it keeps on doubling and adding the double result, at every subsequent rotations. The overall process results in an exponential increase of kinetic energy at every rotation. There is no difficulty to "imagine" that at a certain future moment, the exponentially increasing energy intensity of the difference between centripetal effect and centrifugal effect, will rip both effects from one another. Logically, the centrifugal effect should be projected in all directions while the centripetal effect should recoil on itself, in a counter rotating direction than before. Do we all agree (if my feeling of being alone here is wrong)? I still have a bit of doubt on the accumulation of kinetic energy by rotation during the Planck epoch. Accumulation of energy by constant acceleration. So how can a circular motion, to which is applied constant energy, acquire constant acceleration? 1-The full rotation is made in one second. 2-The distance covered is the blue circle. 3-The centrifugal effect makes appear two more dots because of constant energy applied (here after two rotations). We can easily see that the distance covered by the two new dots is far greater than the distance covered by the previous dots; and they had to cover it in the same lap of time (a second). Which means that they had to go at a faster speed. The result is that the kinetic energy increases from the center toward the circumference, and since this circumference constantly increases because of centrifugal effect, it speed increases constantly, gradually increasing the total kinetic energy inside the line formed by the dots. When the line is ripped in two parts, there will be an amount of kinetic energy that will have been accumulated. That's all I wanted to make sure of. What a “spiral” tells us. Physical “facts” should be explained by physics. This is an evidence. But there is another evidence we mustn’t forget which is: ever since, thousand of years ago, humans started to analyse its environment and specially the space that use to be called: the sky, all we observed was volumes and trajectories. And these are still what we are observing today, whatever the tools to analyse them that are used. So we have to agree that the real nature of what we observe is strictly: Geometry. Basic geometry is what something looks like, when “seen” as a surface representation; but what we see exactly is, in fact, a “volume”; because the surface represented possesses “deepness”. The questions become: What does that depth represent? Where does it come from? Let’s have a look at some of those “volumes” that clearly show spiraling spatial deepness. It is quite easy to observe that depth is clearly manifested as a “spiral” motion. And we already understood that “depth” was given to a surface at the moment of the Big bang. But then, since we know that the expansion of space was a duplication of the stable basic space metric in all directions, there should not be any “spiral geometry” results in space. All we should have is simply an increase of “volume” of that space. So where does that “spiral result”, which is impossible to deny in space, comes from? Let’s see how it could have occur while the basic space metrics duplicated. And even if we see it in 3D, it doesn’t change its “stable” appearance. This confirms that space is “stable”. But if we look again at the second picture (middle of the three) presented higher, we clearly perceive a “time factor” in the evolution of that “natural” spiral. 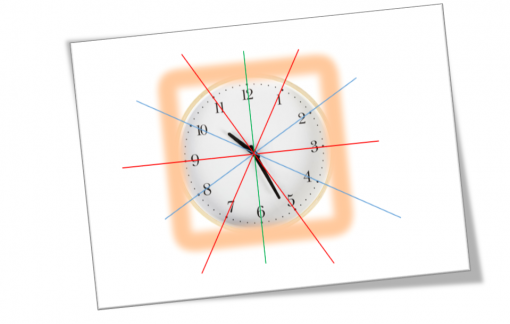 So what happens when we include the Time factor into our metric space duplication? I’ve tried several ways to represent it and the only acceptable way was by making each duplication successively pass through each of the “arms” presented by the “Time flow” at the start of the very first duplication of space. I’ve define the orientation of the influencing flows, in red for the “active” flows and in black for the “passive” flows, on each successive space spheres. The increasing size of the metric spheres is only to show the deepness of “time”; in reality, all spheres have the same “size”. 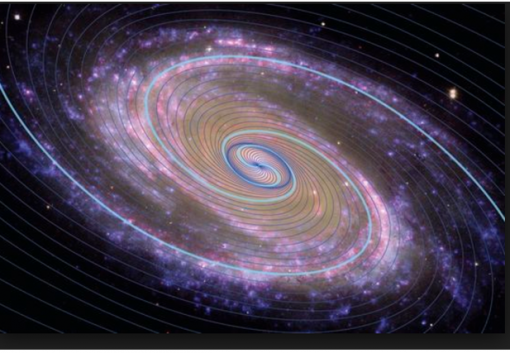 This confirms that Time flow is responsible for the deepness of space and that there is only one single answer to explain the presence of “spirals” in nature, which is the “time flowing” factor. But it also adds that the influence of the 12 basic time flows are successive. Which opens a “door” on a subject that nobody (and even I) wants to consider yet, in science. So we will wait until we dare to. As we can see, there’s no “hole” or “funnel shape” in the space of this spiral galaxy; but there is evidently a “”funnel shape” in its “time factor”. Once again, a satellite doesn’t increase or diminishes “size” the farther away it gets from a center of gravity. Which means that its “space” environment is “stable” whatever the distance. On the other hand, experiences in space demonstrate that its “Time” environment is “altered” by “mass energy”. A) Space is stable; which means, cannot be deformed. The only factor to produce a curved trajectory in “space-time”, is not an “alteration” of space but exclusively an “alteration” of Time. We know that space doesn't rotate; but we've just found an indication that Time could be rotating. It wouldn't be so much surprising for me if it did, since during Planck's epoch, Time flow was manifested by the extending circumference of a rotating surface. So spirals might also present clues that before being a "stable volume", our universe had been a rotating surface. If I'm not daydreaming, that indication would be marvelous. How can a time “alteration” by mass energy deviate a trajectory? 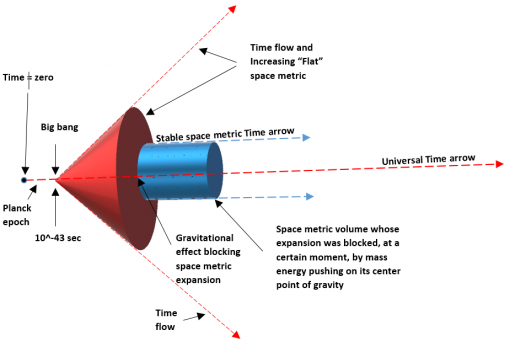 We’ve already seen that time flow is related to space production, which means space expansion. And the space expansion is related to kinetic energy and not to mass energy, since mass energy didn’t exist when expansion began. We have surmise that time flows has light speed, which is an invariant of 299792458 meter covered in one second. Whatever meter you subtract from that amount decreases the speed; and whatever time you add to that second also decreases the speed. So how can expansion celerity increase with a time decreasing factor? It’s easier to understand, if you consider the right information. What increases in expansion is the production of space metric; but the “ratio” stays the same as “doubling a space metric”. Space expands faster because there’s continuously more space metrics that duplicates at light-speed. Let’s say that, in one second, 50 basic metrics duplicates into a 100 which total duplicates again, in the next second, into 200 basic metrics which duplicates, in the third second, into 400… and so on. We can see how space production increases exponentially even if the duplication process (ratio production of one for one) is stable. It’s easy to understand that when time doubles to produce space at the same ratio, time flow gets slower, since time is added to the same ratio production. The resulting slowing of time flow is produced by a stable space ratio production while time is continuously extending. We’ve also seen that kinetic energy density produces a passive “pressure” that delays space production. Just as the density of a Higgs field delays a particle motion by its surrounding passive density pressure, thus giving it mass. If this notion of density “pressure” is good for delays inside a Higgs field, it’s just as good a reason for delaying metric production in a space dense energy “field” without changing the ratio. On the other hand, gradual space production diminishes the energy density which then, reduces “pressure”, permitting a gradual acceleration of space production. Which explains the acceleration of the universe expansion, without the need of dark energy. This takes care of the kinetic energy of “flat” space topology. But what occurs in an altered space-time volume? We’ve seen that mass energy is the same as kinetic energy, with the difference that the energy is oriented towards one single definite point of space (mass energy) instead of every points of space (kinetic energy). The energy's “active” pressure on that definite point of space makes it a center of gravity. The active pressure of mass energy on that definite point in space, stops the duplication of that point at the space metric volume it has attained. And a volume of space surrounding that center points adopts the same metric until another factor enters the equation. We will see this event a bit further on. Stopping the duplication of a space metric at a certain “moment” is not stopping it in “space”; it is blocking it in “time”. In other words, time is momentarily stopped for that center point. That defines the point’s metric “birth” as a stable volume metric. And the single time flow "piercing" through that centered basic space metric becomes "personal" and starts, from this point, to flow in several directions as it was defined to time flow, when occurred the second duplication of space metric, and was confirmed by the following duplications. The flowing of time for that blocked centered space metric follows the hour structure of a time clock as observed previously. We have seen that some angle lines of hours are straight lines of basic metrics where universal time flows freely, while intermediate space metrics produced within the gradually “opening” angles of free flowing time, are “passive” (in black). That is the portion of space where our mass energy operates, and that is where the blocked expansion of space metric can occur. Time always flows forward following the time arrow; so starting at the white blocked space metric that we chose on our drawing, it flows freely where space metrics are in line. Which is at 7, 9, 11 and 1 hr. The 9 and 11 hr are the continuous forward flowing time of our blocked space metric. But the 7 and 1 hr time flows are flowing “sideways” from the blocked basic space metric. Each of them reaches one of the two universal time flows and merges with it (shown by the red arrows). These two secondary time flows had to travel through a certain number of space metrics before merging with the primordial universal time flow. This "sideways" traveled distance defines the diameter of the volume of space affected by the blocked in time center point of gravity. The total "sideways" distance is also a “present status” line that progresses forward in time, toward the future, at the same time level as the center of gravity. We can also note that since we personally cannot observe our present status because it keeps evading forward from us, all we see is the past portion of the flowing present time event. If we transpose ourselves as the drawing’s blocked center of gravity, it’s like if we were progressing spatially “backward” toward the future, always "timely" facing the “past”. These "facts" also add clearness to our progressive understanding of "space" versus "time". A completely clear understanding might reserve very important surprises. Nevertheless, since the time flow of the universe decreases in regard to the stable ratio space production, time flow of the “present state line”, inside a volume affected space, decreases the same way in regard to a blocked stable metric space volume, starting at the center of gravity. Which explains why time ticks faster near a center of gravity than farther away from it. 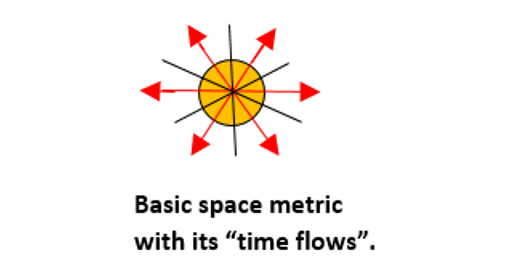 And we must note the difference between that decreasing time volume of the future surrounding the flowing present status of the time metric and the stable “past volume” space metrics surrounding the present status of the basic blocked space metric. Time is an “active” alteration process, while space is a “passive” stable state. And these events are what occurs in a space volume altered by mass energy. Now what is left to do is show how altered time can deviate a trajectory. First we have to understand that time flows all around the center of gravity of a planet; time is “active” and is related to universal kinetic energy. It flows freely through special canals where basic space metric are perfectly in line. So the gradual decrease in time follows the gradual decrease in kinetic energy density as it moves away from its center of gravity. This permits us to define time “corridors” circling the planet. We will consider a constant speed of 100 km/hr in a 60 minutes as representing a straight trajectory in “flat” space topology. Our object will enter and cross a faster ticking time corridor of 30 minutes, surrounding another corridor where time is still faster, meaning a 15 minutes time corridor. And we will observe what happens to our horizontal trajectory in the 60 minutes corridor. The cross on the right side of the drawing represents a 100 km/hr speed as the horizontal line, while the vertical line represents 0 km/hr. The grid is reproduced at every deviation of the trajectory. Our horizontal trajectory entering in a twice faster ticking corridor, takes double more time (ticks) to cover the corridor space, which means slowing its speeds by half, represented as the forward downward red line oriented at 45o between horizontal 100 km/hr and vertical 0 km/hr. If the speed had increase, it would have shown as a 45o upward trajectory. Up is always toward the outside from the center of gravity. Entering the next corridor where time ticks twice as fast (15 minutes), the object’s speed, previously divided by half, is once again reduced by half, represented as an additional 22 ½ o downward deviation (half of the remaining 45o toward zero velocity) of its trajectory. Coming out of that 15 minutes corridor, it regains speed because of the slower time ticking in the 30 minutes corridor, and redresses its trajectory by 22 ½ o.
Re-entering in the 60 minutes corridor, the object doubles its speed, regaining the original speed it had before first entering the 30 minutes corridor. Doubling its speed redresses its trajectory by 45o and recovers a straight trajectory in “flat” space. But its trajectory as now a completely different orientation that it had before interring the time altered space volume. This is how a trajectory curves, slows down and speeds up, while affected by gradual time decreasing which we actually observe at different distances of orbits around Earth. In reality the celerity of the object never changed only the time factor of speed did. And since the real decreasing of time is a smooth reduction instead of the “violent” differences we used, the trajectory comes out as a smooth curve. Another "fact" we mustn't forget is that we have seen previously that universal time flow slows down because of the increase of basic space metrics production at a stable "ratio". But this slowing of the universal time flow doesn't provoke a curvature of its trajectory since it streams through perfectly "straight" lines of "stable" basic space metric volumes. Which means that the universal kinetic energy "pressure" doesn't affect at all the universes topology, but only affects the space production (expansion). So we can conclude that the overall universe possess a "flat" topology "time wise" just as much as "space wise". Which is another information that we can accept as a "fact", without losing time in illogical different possibilities suggested mathematically. Personally, I always keep in mind that a bag never can contain minus two apples; that is an impossibility in what is called: the reality. And the universe is the present reality of an evolving possibility in order to attain the manifestation of its full potentiality. We will make this fast. Let's say that we have two galaxies separated by a distance of one megaparsec. Space between those galaxies expands. Space expansion is simply constant reproduction of a basic space volume which has a diameter of 10^-35 meter, that keeps reproducing as soon as they appear. So the basic space volume reproduction goes like: 1 - 2 - 4 - 8 - 16 - 32 - 64- 128 and so on. It's obvious that space produced between the two galaxies seems to expand more and more faster. The same applies to galaxy clusters, supernovae, or whatever. In fact the swiftness of reproduction is exponential; so if the space between the galaxies doesn't expand exponentially, it means that the mass energy at the center of the galaxies prevents them from being dragged as fast as they would be if it didn't have mass energy. That reproduction process is the "acceleration" of the universe's expansion scientists talk about. The fact is that the two galaxies are indeed getting apart faster and faster; but there is no need for the involvement of "dark energy" whatsoever to explain it. Space expansion is always at the same "ratio" (speed) meaning one basic volume for one basic volume; and there is no real acceleration of expansion speed. As for the "real" expansion speed, it lies in the speed manifested inside the basic volume metric itself; and since it takes 10^-45 second to cover 10^-35 meter, at light speed, expansion speed is light speed. How do we know that the Universe is expanding → as opposed to → the point of origin (creating something out of nothing) is still creating more fabric of space that simply pushes the universe, created earlier, further out? The main source on that information is that the majority of galaxies keeps distancing from each others¸the distance between each of them constantly increases. On the other hand, the "motion" doesn't start from "somewhere" in particular; it manifests itself "everywhere" at the same time. We usually say that there's no center in the universe; in fact it would be more exact to say that there are centers everywhere in the universe. For example, if you look around you, you are at the center of everything you see; and even if you move to another location, you're still at the center of all that you see. This is not an "impression"; it's a fact. The whole universe is a "unity" that is the "center" of itself, because there's nothing else that exists to surround that center and differentiate it from its (non-existing) surrounding. This also explains that the universe is infinite (without any surrounding) while being a definite volume (which exists). The reason you can see a center is only because you see a circumference; without a defined surrounding, you cannot see a center. Try it on a white piece of paper. It will contain centers everywhere on the sheet until you define the specific surrounding of one of those centers that you choose. These are "facts"; not "imaginations". Let’s come back to this fascinating notion and its problems. So we have two galaxies separated by one megaparsec. Space between them expands exponentially, but the distance between them grows slower than exponentially. 1-	Having mass gives galaxies weight which makes them “resist” the “pushing effect” caused by basic space metric reproduction between them. 2-	They have proper kinetic energy and they are traveling toward one another slower than space production. Answer no 1 is hard to accept since all basic space metrics between the two galaxies are duplicating; so space has to be constantly reproduced between each galaxies. Furthermore weight is gravity related (in fact it consists of speed differences) and there’s no gravity in “flat” space (nor speed differences involved here). Answer no 2 is more acceptable but, sadly enough, is impossible. The first reason is because galaxies don’t attract each other; so their proper kinetic energy has no reason to make all of them (in the universe) travel toward each other. In fact, they don’t. So our only two possible answers reveal to be impossible. What, then, is the real reason for the discrepancy between space production and the speed at which the galaxies move away from each other? What we’ve just found out is that it doesn’t seem to be “space related”. Which leaves us with the only other possibility that it is “Time related”. Which brings us back to the fact that “motion” is time related while “space” is of static nature. In other words, “action” manifests itself in “time”, while its “passive result” manifests itself in “space”. We must remember that when we speak of “time” we are talking about a “Time flow”. So what we are dealing with here, would be that the “time flow” of galaxies is slower than the Universal Time Flow. This has to mean that their “time flows” are “different” from one another. We are now facing the question towards that “difference”. In what way are both “time flows” different from one another? The only difference I see is that one is “Universal” while the other is “Local”. The “Universal Time flow” isn’t contained in anything; just as the “Universal space”, meaning the Universe, is not confined in anything, even if it possesses a volume. So the Universal Time flow is also “infinite” though having a volume, while the “galaxy time flow” is contained inside a “time deformation” specific volume. The circumference, of this galaxy time deformation volume, stands where the galaxy time flow reaches the “Universal Time Flow” (as seen in a previous post); which makes the defined volume of “galaxy time flow” itself, ALWAYS slower that the “Universal Time Flow” since the demarcation of its circumference is being defined by the difference in their speed flows. We can understand that what defines the volume of time deformation of a galaxy is the last difference of their flowing time speed. And since both are related to different “space volumes” the space related to “Universal Time Flow” possesses a faster “motion” than the space volume related to a “galaxy time flow”. Which confirms the “fact” that when gluons appeared in our universe, they were surfaces which became “volumes”, “added” to existing expanding space, resulting in two types of “independent space entities”. We can separate them as “inflation related space” and “expansion related space”. In fact they were separated since the "action field" of a gluon was defined at 10^-15 meter, while the universe kept expanding (not being defined). On top of those slower time flow volumes, we have some galaxies that gets closer to one another, which confirms that each galaxies also have proper kinetic energy. So finally, we have to end the identically relation between “Universal Time Flow” and “galaxy time flow”, the same way we did with “universal space” and “gluon space”; They are not "the same". Which, by the way, becomes very logical. So both kinds of “spaces” don’t have the same time flow; but, in a certain way, we already knew it because they don’t have the same “age”. This last comment brings us to another awareness which is the possibility that the “age” of a center of gravity defines its proper kinetic energy. Which, once again, pulls us to the notion of the surrounding energy density of each epoch. We already saw that the more the energy density is important, the slower is the “motion” produced by identical amount of kinetic energy; and energy density has been decreasing since the Big bang. Now, we are back to our first explanation of the accelerating expansion because of a gradual decreasing energy density. So the whole process is confirmed by whichever ways of analysis. The simpler explanation we can resume for the process, is that “motion” is the result of kinetic energy; but the speed of that “motion”, in regard to a center of gravity, is not related to the “amount” of kinetic energy involved but, rather, to the surrounding “density” of kinetic energy involved. Which makes us conclude that “inside” the volume surrounding a center of gravity, exists kinetic energy proper to that center of gravity; and that kinetic energy has no relation whatsoever with the universal kinetic energy. This confirms that the “center oriented kinetic energy” inside the original gluon surface was “added”, but “confined” kinetic energy, when gluon appeared in the universe and was never released in “flat” space. This is a very interesting speculated theory; but it will stay a “speculation” until I can explain why, and how, “confined” kinetic energy, that is oriented toward a single point (center of gravity), can propel this center point in “space” while blocking it in “Time”. On the other hand, we know that “motion” is dependent of “time” and not “space”. One thing is certain: I need rest. Where does “speed” comes from? I did rest a bit (I hope it was enough) and then, reread my last post. 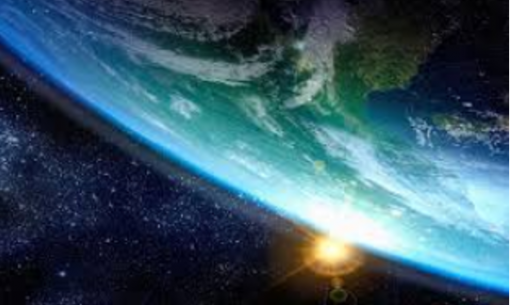 1- The overall non-confined space volume of our universe is growing exponentially because of the gradual diminishing “pressure” of the energy density caused by the “passive” duplicating reaction, of each basic space volume, to the invariant kinetic energy of the universe. 2- This overall non-defined universe volume contains local defined space volume made of center oriented kinetic energy (let's forget the matter notion), where basic space volume don’t duplicate. Each of those defined, which really means “confined”, energy volumes appeared in our universe at different times; which specifically means: at different energy densities of the universe. The effect is that each of those volumes responds to different expansion “speeds” in relation to their “time of birth”. Now; we do observe that evolution continued exclusively “inside” these local defined space volumes (galaxies); outside of them, only expansion is manifested. This evolution processed by gradually defining “viability” qualities, which produced “stages” in the “viability searching process”. This is what we call “entropy”; and it really exists only inside galaxies. Evidently, each of those evolving “stages” defines its own “speed margins” with its “life span”. This last observation being acknowledged, we have to apply the previous conclusion and accept that the “date of birth” of each “viability stages” is accountable for the “speed margin” related to each stage levels. Finally, we have to agree that the speed which each particle, inside that local defined space volume, possesses is related to its personal “birth date” on the universal “Time flow” which started at 0+ second and as flowed until today. And this speed has to be within the particle’s (confined energy field) stage level speed margin. This would mean that, the younger a particle is, the greater is its speed. Which should be confirmed by the observations of older particles having less speed than younger ones. In other words, a Top quark should be slower than an Up quark. The problem now is to choose which referential we can use to compare “speed” of particles. In fact, there’s only one single reference possible, which is a speed that is an “invariant”. And this is “light speed”. On the other hand, how can we use light speed which freezes time and annuls distances when speed is a relation between time and distance? Taking as a reference the fact of moving so fast that time becomes “zero”, which makes cover a “null” distance, being the fastest speed possible, would then mean that not moving at all, covering no distance in no time, should be the slowest speed possible. Then, “slow” defines itself as being distance related to Time, and “fast” is defined by Time related to distance. A funny way to consider an equation; I must say. But it does confirm the "curious relation" between Time and Space we've met everywhere yet. Luckily, this cannot be acceptable for the simple reason that distance in “space” appeared AFTER distance in “Time”; which means that the first relation to “speed” has to be a “time” factor. So the first description of “light speed” has to be observed as a Time factor versus a distance factor. At the Big bang, the time factor was 10^-43 second versus 10^-35 meter. As we can see the mathematical Time factor is greater than the distance factor; but in fact, the time factor is shorter than the distance factor. So what happens when this speed event is doubled by duplication of the distance factor? Would it work in a normal miles per hour example? To check we have to use the relation hour per miles. So let’s try it. Let’s use as basic the hour representing the distance of 100 miles (100 miles/hour). In order to check the speed, we have to increase the distance covered in the same time lap, since 100 miles becomes the shortest distance possible (it’s our relation to Planck’s length). What we are verifying is the “speed” of motion “inside” the overall expanding universe. 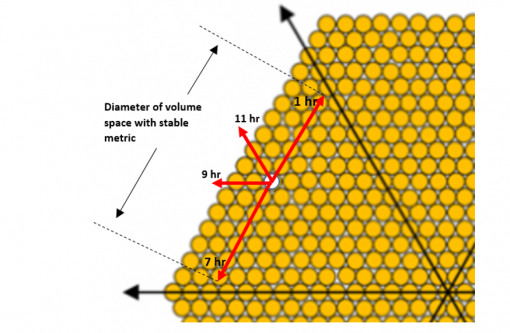 And we know that duplication of “basic” space volume is the slowest when greater is the energy density. So the “speed” of overall space expansion was the slowest when the energy density was the greatest. Which means that even though “inside” the basic volume, distances where covered at light speed, the duplication (creation) of basic space volume was at its slowest speed. Coming back to our Top quark being composed of many “basic volumes”, because its volume is 10^-15 meter which is a lot more than 10^-35 meter, we find that “inside” a Top quark, the “speed” duplication of basic space volume is a lot slower than inside an Up quark that appeared quite a bit later, when the energy density of the universe was putting less pressure on basic space volume production. So normally, the volume of an Up quark should be bigger than the volume of a Top quark since it would cover more distance in the same lap of time. But the fact is, that both quarks have the same volume since they are confined inside the “active field” of a gluon. We mustn’t forget that quarks are “center oriented energy particles” and are defined by the effective range of the gluon’s field. So whichever quark that is involved, it always has the same “volume”; only its "inner" energy density changes; we qualify it as "its mass". So our verification of “speed” is, here, restricted to an “invariant” volume which means that the acceleration of duplicating basic space volumes inside a quark, has to gradually diminish the time to cover the space related to the gluon’s field. What we observe now is, not only speed is faster inside younger quarks, but speed is also faster around them. But we also observe a difference in relations. Inside a quark, the acceleration is related to a “time change”, while outside a quark, it’s related to a “distance change” (duplication of the distance factor). Euh…I probably didn’t rest enough; I’ll be back. Sorry but I just attained a point where my mind has to put its feet on “solid ground” for a while. I wonder how solid that “ground” will be. 1-	Our universe is made a 100% of manifesting kinetic energy since the Big bang. 2-	Its “dynamic” produces a Time flow motion, which started at the “birth” of the manifestation. This Time flow pierced through the Big bang event and spread in specific directions defined by the space production conditions. 3-	This kinetic energy of our universe is presently manifested in two separate behaviours: a) 70% towards every points in space since the beginning, and b) 30% towards some specified defined points in space since a bit later than the beginning. 4-	This 30% of our universe is observed as bubbles (volumes) of space where kinetic energy is “confined” because of its orientation which prevents it from expanding, while 70% of the rest of space is oriented “free flowing” kinetic energy producing its expansion. 5-	The main, or universal, Time flows dynamic is manifested by the continuous duplication of the basic metric of a space volume within this 70% of “free flowing” space production. Each basic metric duplicates itself continuously which produces an exponential creation of space we interpret as an acceleration of expansion. 6-	The universal Time flow is basically stable because it is based on the total manifesting kinetic energy of the 70% free space, which is an invariant. 7-	Since the 30% of “stabled” non-expanding space possesses its own “birth date” on the universal Time flow, each “bubbles” (volumes) of confined kinetic energy have a starting point for their proper time flow we can state as “secondary” time flows. 8-	The total kinetic energy within the universe is an “invariant”; which means that the more basic metrics production we have, the less of energy “density” applies to space. 9-	The “birth date” of secondary time flows started flowing at the same “speed” as the universal Time flow; but since the “speed” of the universal Time flow is in constant relation with exponential space production, while secondary time flows manifest in a stable not reproducing space, when both are compared, the universal Time flows “speed” gets gradually slower while secondary time flows stays constant. 10-	Now, within this 30% of stable space volumes distributed in the universe, we find other space “bubbles” (volumes) that possess later different “birth dates”. Those space “bubbles” appeared when the overall energy density, gradually diminishing, forced the stable space bubbles energy density to adapt to its surrounding decreasing energy density. These adaptations happened at three successive intervals. We can call those “birth dates” as third, fourth and fifth times flows. And the “birth dates” of their proper space volume successively appeared always inside the preceding space volume, so all those different defined space volumes ended up one inside the other. 11-	Each of those three successive adaptations where trying to protect the density of kinetic energy confined within themselves; but only the third adaptation succeeded in stabilising with its environment’s energy density. 12-	This last success protected an amount of denser confined kinetic energy, inside a defined space “bubble” surrounded by the previous intercalated “bubbles” (volumes) previously defined which had adapted to overall energy density. When, afterward, these fifth time flow “bubbles” happened to touch each other, they merged their “birth” center points making more “active” kinetic energy oriented towards that new center point. 13-	When sufficient kinetic energy was applied to such a center point, it pushed back the “birth date” of the new space density volume on the universal Time flow. 14-	When the kinetic energy pressure wasn’t important enough, the result was that the whole energetic space volume started nuclear reaction at the “birth” center point of space volumes. 15-	And when the pressure of kinetic energy was even less, the result became space volumes where energy was simply denser than overall energy density. We call those space volumes: “matter”. 16-	This “matter” is either solid, liquid or gaseous; depending of the “inner” kinetic energy density of each its composing energy space volumes. This so called "matter" occupy 5% of the overall space in the universe. 17-	The accumulation process for this “matter” is related to gravitational tidal effects observed at Lagrangian points within stable space volumes. I guess this is how we can analyse our universe, when we are not obsessed by “matter” occupying only 5% of the universe. Surprisingly it seems to me, less difficult to understand. How can universal gravitation stop expansion abruptly without passing, first, through slowing down space expansion phases? What we observe is galaxies inside which expansion is completely absent and “outside” of galaxies where expansion manifests at a stable “ratio”. There are no “in between” phases. If gravitation was “universal” there would be space where gravitation manifests itself gradually decreasing; which is not observed. The expansion “ratio” of space is the same everywhere; meaning “zero ratio” inside galaxies and identical “ratio” everywhere else. On the other hand, we do observe gradual decreasing time inside galaxies just as much as outside galaxies, way down to Cosmic Microwave background (CMB) 13,8 billion years ago. The only answer possible is that gravitation “stops” a center of gravity on the “Time scale” instead of on the “Space scale”. Space is not “deformed” but is rather “blocked” in its “Time flow” at its “birth date”. This, once again, confirms that gravitation is not universal but local.